was first Super Jamano, then Super Jamono and finally Super Diamono. most auction-sites claim it was 1984, one page said late seventy’s. My instincts say 1979 or 1980, what do you think ? very much, highly original sound. And that sweet voice, is that Omar Pene ? Moos you are a magician, less than a week ago,I discovered that this cassette was also released on vinyl and I was sweeping the web without success to locate it. Listen again the album, the unknown voice is Ismael Lo and of course his harmonica. Someone of Senegal told me that Endo’s discography many errors in dates, I will ask him to help me and adjust dates. Hey Ngoni, good to see you’re here. Thank you once more…Be good!!! Grumpy is right. I have this cassette with 1984 on the sleeve. I love so much when Omar Pene & Ismael Lo sing together (Yaraal Sa Dom & Mame Coumba are must). I listen this music for years & years (22) and it’s always a great pleasure. Definitely one of my favourite band. Thanks a lot for this rare vinyl version. Truly amazing music… its on constant rotation! @ aduna, I knew I would see you on here! thank you for such an amazing post… this band is electrifying! I cannot get enough of this sound. According to my Senegal friend Diamono supporter from the beginning,do not think that 1984 is the year of the first edition of Ndaxami. Super Diamono then recorded several cassettes a year, but not as many as listed in the discography of Endo. He confirmed with certainty that Volume-Baol and Volume-Casamance came out in 1984 in Senegal. Believing remember that Ndaxami cassette was released in 1982 and People in 1983. In 1984 they released several albums in Europe and we have a confused chronology, of course the cover of the original cassette Ndaxami is a photo of the group, not the one showing 1984 with the same image of the LP. 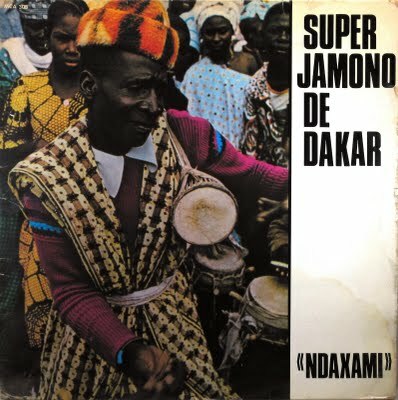 Jamono or Diamono means Generation in Wolof. any chance of a re-up? would really like to hear this! Some sources mention 1980 as the year of release. It was the year when Ismael Lo joined the band, could be the first record featuring his vocals.